Recently I ran into a problem installing the SCCM client on some Windows Server 2008 R2 systems. In digging through client.msi.log, I found errors 0x80004005 and 1603. Steve Schofield, Microsoft MVP for IIS, discovered the problem was with the client install was, for some reason, performing IIS checks on anonymous authentication. If the authentication is configured to use Application Pool Identity, which was a new feature in IIS 7, then the install will fail. The workaround is simply to switch to using IUSR, install the client, and switch back to the Application Pool Identity. This successfully resolved my issues on a dozen R2 servers! Thank you Steve!! This entry was posted in ConfigMgr 07, Troubleshooting and tagged IIS, SCCM Client. When our company first implemented Windows 7, the performance was quite good and we were impressed. However, now that Win7 has been in our organization for the last 1 1/2 years, we’re beginning to see a significant performance degradation in boot times. What was a 1 minute boot time can now be anywhere from 4 to 10 minutes for Windows to get to Ctrl-Alt-Del screen. In performing analysis on extremely slow boot/login times, I identified both the cause and a Win7 hotfix to correct the issue. If you are having a similar problem, check out KB2505348 – High CPU usage or a lengthy startup process occurs during WMI repository verification when a large WMI repository exists in Windows 7 or in Windows Server 2008 R2. One has to chuckle at Microsoft’s titled description on the issue as “lengthy startup process” which in the real world means “so slow that you never want ever EVER shut off your computer because every time you do, you consider making a switch to Linux”. This entry was posted in Miscellaneous Ramblings, Troubleshooting and tagged SCCM Client, Windows 7, WMI. If a Win2k8 R2 server should experience an alert from SCOM that the SMS Agent Host (e.g. the client) service is running, then the resolution is to simply restart the server. It is possible to prevent this on new server builds – Microsoft claims that restarting the server after installation of the SCCM client will keep the issue from occurring. This alert is generated because the client crashes and then does a self-reinstall to recover from the error. You can confirm the client is crashing by checking for application event ID 1000 and 1001 for ccmexec.exe or system log event 7031. Microsoft has confirmed this is a recently discovered issue with SCCM 2007 clients on R2 servers and that the information is currently only published internally. The root cause is that Microsoft has found a problem in the code, but it is only fixed in SCCM 2011 and won’t be for SCCM 2007. 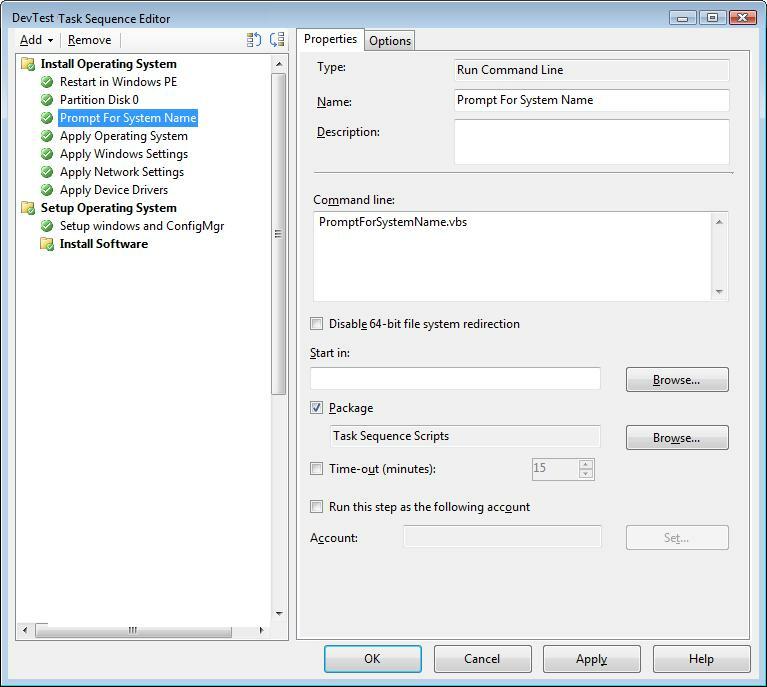 This entry was posted in ConfigMgr 07, How-To and tagged SCCM Client. This was an issue that I came across from our recent upgrade from SMS 2003 to SCCM 2007. While we were still using SMS, some systems had been cloned/p2v’d from a production system to a virtual then renamed. It wasn’t caught at the time, but it appears SMS may have been unable to automatically give the cloned SMS clients a new GUID. When we migrated to SCCM, these clients were fighting over which of them was the real and live system in SCCM, such that some client records would suddenly disapper from the console…then if they’re client was fixed, a different client record would disappear. However, simply uninstalling/reinstalling the SCCM client was not resolving the issue. After some digging around, I found a couple of utilities to help rip out the SCCM client and force a new GUID to be assigned. I brought these utilities together and created a simple executable to coordinate the process. This was created with the old, but very reliable, SMS Installer, the code below is for that, but can easily be rebuilt as a vbscript. If you have any questions about this process, feel free to leave me a comment and I can respond! Below is the ‘code’ for the SMS Installer executable that I built to facilitate this. This entry was posted in ConfigMgr 07, Scripting, Troubleshooting and tagged SCCM Client, SMS Installer.